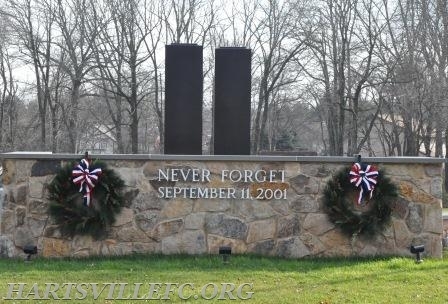 On Tuesday, September 11, 2018 the Hartsville Fire Company will hold a 9-11 Flag Memorial and Memorial Service. The Flag Memorial will consist of a display of 403 American flags on the front lawn of the Fire Station. The flags represent the 343 New York City firefighters, 37 New York Port Authority officers and the 23 New York Police Dept. officers who died while saving others on 9-11-2001. Two additional flags will represent Volunteer Firefighters John Kulick and Tristan Smith who were killed in action in Iraq. The station will be open from sun-up to sundown for visitors who may wish to “stop, reflect and remember”. Although emergency responders are foremost in our thoughts and prayers, we wish to remember everyone who lost their lives in New York City, Washington, DC and in Shanksville, Pennsylvania on September 11, 2001. A Memorial Service will be held at 7:00 PM. It will include a reading of the names of the fallen Firefighters and Police Officers. The public is invited and attendees may participate in reading the names and retrieving the flags.